DAD-e 2004 is made from a green material with black button eyes and a larger black button nose. He wears a brown ribbon tied around his neck with the words “Father’s Day 2004” in orange writing on it. Embroidered on his chest are the words “Super Dad” in gold thread. You get the recognition you deserve! DAD-e 2004 was released on 19th May 2004. His birthday is on 20th June 2004. 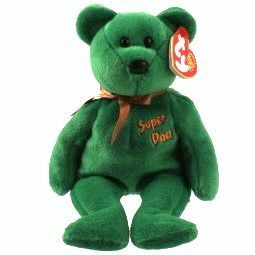 He is a Father’s Day Beanie Baby and was exclusively available on the Ty online store. He retired on 15th July 2004.